I do moderate exercise...Do I need to eat a bunch of carbs before my workout and high protein within 30 mins after my workout? I feel like all this salt is over powering my food...What are some of the ways you get salt in? Aren't you concerned about the bad health effects of eggs...the fat and cholesterol? How important is it to eat fresh eggs? I have been Keto since the beginning of May and have only lost 14 lbs. What can I be doing wrong? What is your favorite Keto dish? 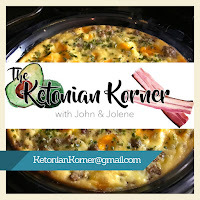 How long have you been Keto and will you ever return to your old way of eating?